Often as a child we had family game night. It was one of the few times we were all together enjoying each other’s company and bonding as a family. Playing games with my family not only brought us closer together, but it also taught us critical thinking, how to have friendly competition, and teamwork skills. During family game night we had hands on learning without even knowing it. Now that I have a family of my own, we enjoy keeping this tradition alive by having family game night as well. 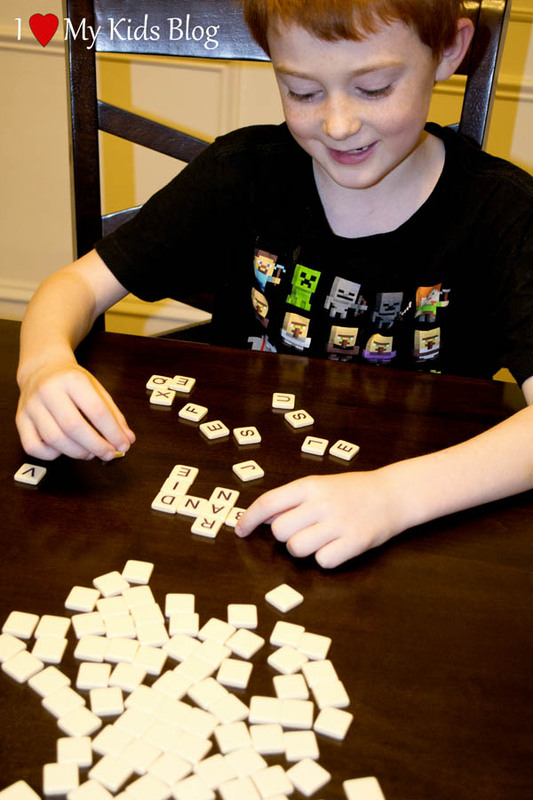 Bananagrams has many fun and educational games that fit right into our family game night. All their games encourage critical thinking, originality, education and friendly competition. This past week we played Bananagrams Wildtiles, Fruitominoes, and Appletters, each of which are part of the Banagrams family. We had a fun time learning the rules of all these games and competing to be the winner. The first game we played was Appletters. 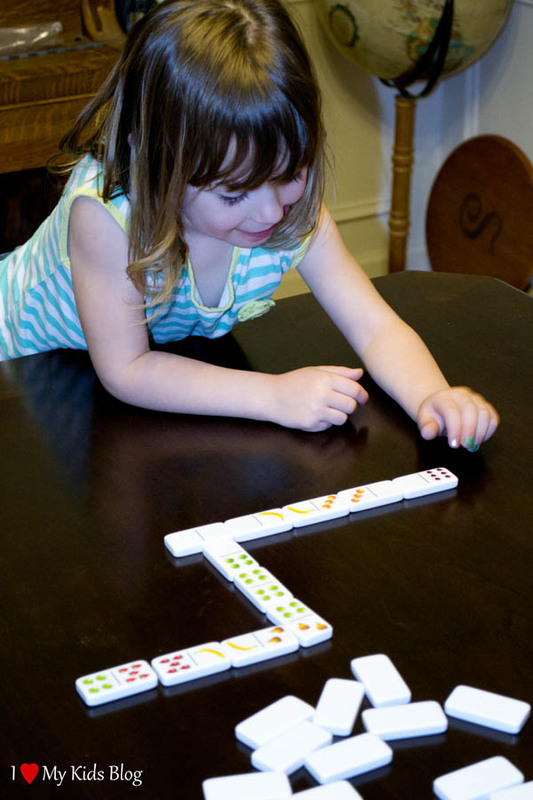 The idea of this game is to work together and build a “word worm”, by creating words off the front or back tile of the words in play. Much like dominoes, but with letter tiles instead of number tiles. It is recommended that Appletters is played with 2-4 players. Each player selects 12 to 15 tiles to start, depending on how many are playing. To determine who goes first, each player draws a tile from the remaining pile, or “core” as it is called. Whoever has the letter closest to “A” goes first. At the beginning of each turn the player then selects a tile from the “core” and discards one from their hand, placing it back into the “core”. The first player then places a word and play continues in a clockwise fashion. If at any time a player is not able to make a word off the front or back of the worm, they knock on the table and say “pick and pass”, grabbing 3 tiles from the core. Their turn is then over. When a player is out of tiles, they are the winner. However, if there are still tiles remaining and no one is able to create a word, the person with the least amount of tiles in their hand wins. The age recommendation for this game is 5+ years old. I think that is a good suggested age range. My two 7 year olds did well with this game and had fun putting words together. 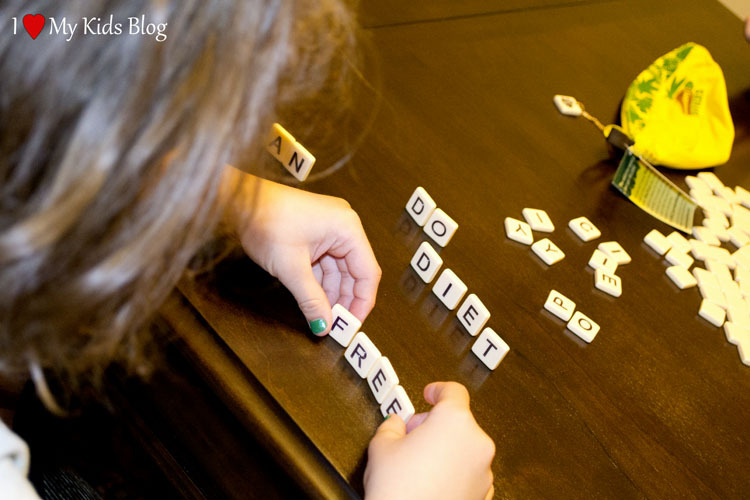 As a mom, I enjoyed watching their minds process the letters in front of them and ponder the next move. 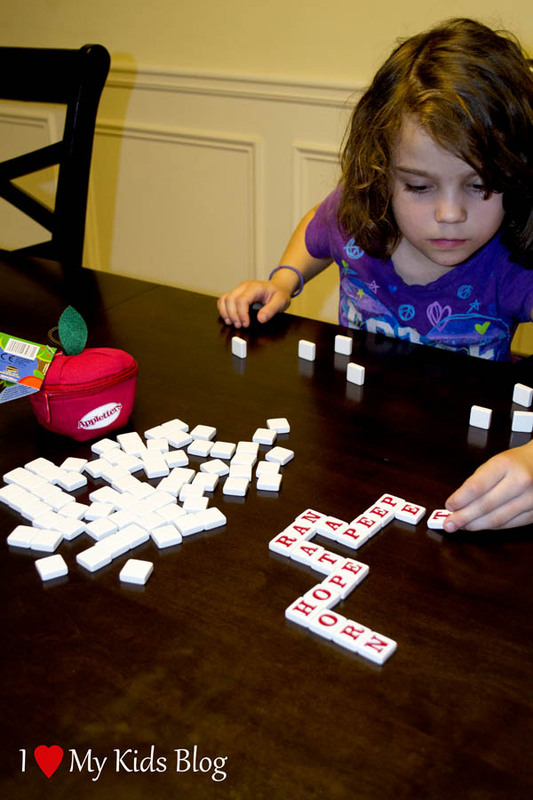 My 4 year old had the help of her dad, and enjoyed placing the tiles and trying to spell the few words she does know in her spelling vocabulary. This game goes fairly quickly once the rules are understood and is perfect for taking with you on family activities and outings. The second game we played was Fruitominoes. To begin this game, all tiles are placed face down and players select 5 to 7 fruitominoes. Making sure to keep the pictures on the tiles concealed from others, they are then stood up in front of each player so that no one can see them. The player with the highest double fruitominoe goes first, placing that tile in the center of the table, then play continues in a clockwise fashion. The second player tries to then match one of their fruitominoe tiles to the one previously placed. A player must play a domino on the board if they are able, however if they are not able, they must knock on the table and say “pick”. Play continues until one player has used up all their tiles. If no one is able to play a tile then the fruits on the fruitominoes are counted up and the player with the lowest score becomes the winner. This was a very fun game to play and entertained my children for an extended period of time. 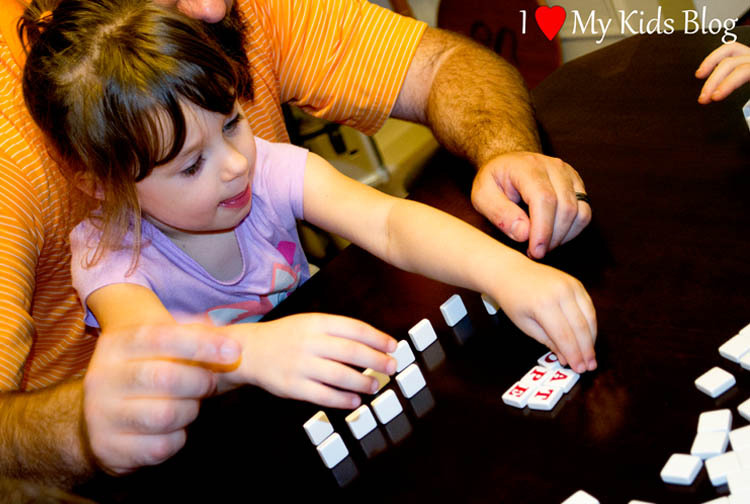 Played like regular dominoes, this game brings new elements for children of all ages to engage in. It introduces counting, matching, and grouping items together with pictures of different fruit combinations on each tile. 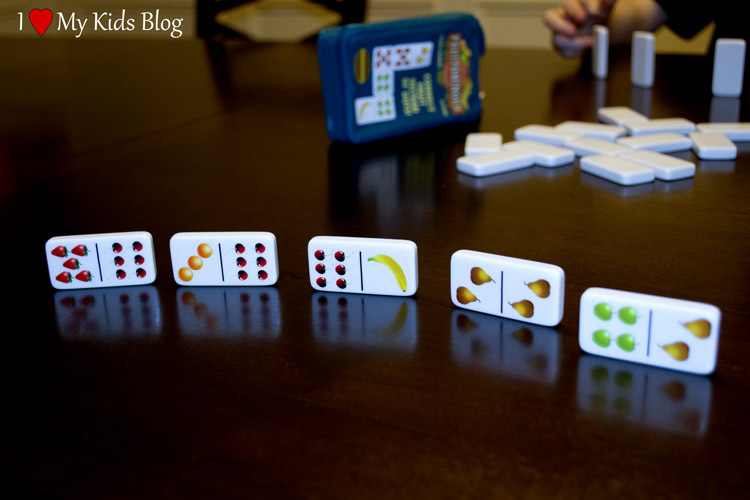 It is recommended that Fruitominoes is played with 2-4 players, ages 5 and up. However, my 4 year old was perfectly capable of playing this game. My husband nor I assisted the game play after the first round. It is so much fun for my children, however I would have liked to see more pieces added to the game. There are only 28 pieces to the entire game, which makes game play go pretty fast. I see that as a pro and a con. The third, and final, game we played was Bananagrams Wildtiles. This game puts a new spin on the game Bananagrams, by introducing 6 “Wildtiles” to the bunch. It is a fast-paced crossword game that is played with 2-8 players. All tiles are poured onto the table and placed face down, creating the “bunch”. Depending on how many players are playing, everyone then takes 11-21 tiles. Once everyone has collected their tiles, someone says “Split” and game play begins. The tiles are then turned over in front of the player and everyone begins to form individual word grids using their tiles. Words can be as little as 2 letters, so long as they are actual words. Words can be horizontal or vertical, reading left to right or top to bottom. No one takes turns, because it is a race to see who can create a word gird using all their tiles first. If a player has a wildtile in their hand, it can be used as any letter in the alphabet. It can only represent one letter at a time while in the grid. A fun twist to this game is that players may rearrange their word grids at any time. Once all tiles in a players’ hand have been used up, that player yells “peel” and everyone takes one tile from the bunch, no matter how many tiles are already in their hands, and the game play continues. Any time during the game, a player may discard an unwanted tile face down to the bunch but in turn has to select three additional tiles. The first player to use all their tiles in a connected word grid when there are less tiles in the bunch than players shouts “bananas!” The winning grid is then inspected by those at the table. 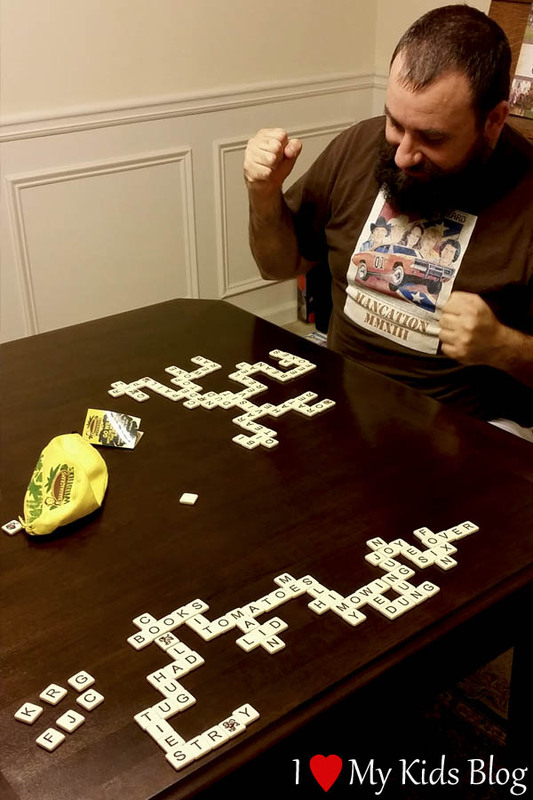 If any word in the winning grid is found to be unacceptable, that player becomes the “rotten banana,” returning all their tiles, face down, to the bunch and the games resumes until another player thinks they have won. The recommended age for this game is 7+ years. The first few times playing as a family were a bit challenging. My two 7 year olds have different spelling and reading abilities, so for one the concept of building a crossword using words 2-10 letters long was not extremely complicated, but for the other it was. I believe it was mostly challenging for them though because of the independent element of this game. Had we played taking turns, on a slower paced scale, they would have done much better. We can work on building up their spelling skills and understanding of the rules and then once they feel more confident with themselves, we can make it more of an independent competition at a faster pace. My 4 year old was completely lost, but that is okay. She had a great time spelling words she knew and got very excited seeing everyone else succeeding. Once the kids went to bed my husband and I sat down and challenged each other. Knowing we had only skimmed the rules the first time, we tried to get all of them down before we played. As the rules are written, it is very complicated to understand. We ended up finding the YouTube video of the game put out by Bananagrams to make sure we were playing it right. Once we understood everything correctly, the game was on. My husband is great at crosswords and spelling challenges, so he enjoyed the game a lot. We look forward to adding this game to our friend game nights and bringing a greater challenge to the game with other adults. Overall, these three games are going to be a great asset to our family game night. You can make these games as basic or competitive as you want, while allowing the rules to get more complex, depending on the age group you are playing with. I am excited to have them to encourage reading, writing, and friendly competition. We will be using these games throughout the summer on our afternoon picnics and may take them with us when we go out to eat for pre-dinner game play. Which one(s) do you think your family would love to play and why? Leave a comment letting me know. Disclosure: I received the items mentioned above so I could form an opinion to share with you. Regardless of this arrangement, I was not required to give a positive review. All opinions expressed above are my own honest thoughts. Thanks for reading! Bananagrams has to be one of my favorite games to play!